RMC Publications, Inc. is please to announce its new version 4.3 of PM FASTrack, PMP exam simulation software, complete with updated questions and additional functionality. PM FASTrack is a robust exam simulation program that lets you discover the gaps in your knowledge before you take the PMP exam. It contains 1,300 questions - simulates the range and depth of questions that may be found on the PMP exam. This can't be found in a book. You can take hundreds of exams in 4 testing modes including Knowledge Area, Process Group and by keyword as well as a Super PMP Exam - the hardest questions. I have bought lots of books in order to be prepared for the PMP exam. This CD, combined with Rita Mulcahy's book and the PMBOK, is the best combination I could find on the market. It forces you to think the "right" way and fully explains each answer to all the questions. Moreover, it is as close as possible to the real exam. I do not regret the investment made, as I passed the exam on the first attempt. If you want to get your PMP, I highly recommend this product and the asociated flashcards to help prepare for the test. There are many competing products from which to choose. But, none more complete and easily read than Rita's. Don't waste time, learn the PMBOK, buy Rita's suite of materials and blow the test away as I did! This CD helped a lot. I just passed my PMP on April 9th. I can honestly say with out this cd I would have either barely passed or not passed at all. The questions are somewhat similar to the ones on the pmp. They are very challenging. For anyone that's interested I started off studying Kim Heldman's book along with using the PMBOK as a reference. 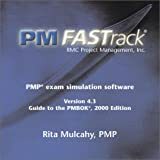 I then moved on to Rita's PMP Exam Prep book and then ordered her pmp fastrack cd. That was basically my whole studying plan. I can't say exactly which one was the best or helped me the most. Kim's book I used for a solid foundation. Rita's PMP Exam Prep I used to get all the little tricks for memorization I would need. After that I knew I still needed to answer practice questions just to get me familarized with answering potential questions on the exam and that's were the PMP Fastrack CD came in. I didn't use any study group because that's just the type of person I am as far as studying. Some people may learn better in a study group though. Use whatever study method works for you. In short the cd was a tremendous ableit over priced cd. (I don't see how she can justify selling it for $300 seeing as it's really a very basic program written in some form of MS VBA) But the good news is you'll always find someone willing to buy it off you on ebay or this site so that'll soften the blow somewhat. I would give it 4.5 stars mainly because of the price but since I can't I'll round it up to 5 Good luck. This is a very close simulation of the actual PMP test. By this I do not mean that you will see any of the same questions on the actual test, what I mean is that the questions will be of the same level of difficulty, phrased in similar terms, and covering the same subject matter in the same proportions. By taking many of the different practice tests I was able to pinpoint my areas of weaknesses, make them strengths, and then discover new areas of knowledge in which I needed work, slowly and steadily raising my grade with every practice test I took. To the credit of this method, I saw my grades increase by about 3 to 5 points with every test I took after studying, and the actual grade I achieved on the real test was just another point in the same upward slope. The real test is extremely grueling, a test of stamina, focus, and knowledge, and I found the practice tests to reflect this very closely. Four hours might seem like a long time to be given for a test, but clearly reading and correctly answering 200 questions in that time is no easy task. Even though I considered myself a good test taker and had passed many certification tests in the last couple of years, I could never have passed the PMP test without the use of this excellent simulation software. The 4th Edition of the PMP Exam Prep is a Course in a Book and is used in 43 countries to help project managers pass PMI's PMP Exam. It contains not only sample exams but detailed review materials, games and exercises based on accelerated learning theory and insider tips. PMP Exam Prep was developed to help you learn more and study less - up to 70% less than using conventional study guides. It contains information about core concepts of project management, information on the PMP exam that is not in the PMBOK and helps you understand how the PMP exam is constructed. 1) Great Layout: Each section is layed out according to the PMBOK's organization. This greatly assists the reader when referring from area to area. 2) Solid Information: Rita provides information you need to know to be a solid Project Manager. In addition, she provides enough information to the level of granularity needed to pass the test. A key diagram I felt very helpful is her overview of the steps (in order) needed to go through the Project Lifecycle from Initiating to Closing. And at times, she lets you smile as you read :-). 3) Practice Tests: I concur with a previous reader. The questions are more difficult in Rita's books than they are on the actual test. However, Rita's questions make you think through the process and promote a deeper level of understanding that is needed to answer the "simpler" questions on the PMP test. The only drawback of Rita's books are the lack of additional questions. A CD is provided that is sold seperately (Fast Track). I would have preferred a few more questions that the 24 demo questions for the price of the book. The bottom line--I passed the test. My recommendation. Read the PMBOK and understand inputs, tools, outputs, and flow. Buy Rita's book to greatly enhance understanding. Then buy another book with additional practice questions as well. First things first, I passed the PMP certification exam! I did not take any classes or workshops, I relied exclusively on the PMBOK, the 'PMP Exam Prep' by Rita Mulcahy, her practice CD, and the thick and not-so-effective 'Project management - a systems approach to planning, scheduling, and controlling' by Harold Kernzer. I have to admit that when I first received the pricey 'Exam Prep' I was disappointed by its format (amateurish) and what seems to be, at the time, shallow content. I also felt that the sample questions were scarce and essentially designed to lure you into buying the practice CD. However as I started to study for the PMP exam I felt that the book was very effective and a much needed complement to the PMBOK. It went straight to the point, told you what was important to memorize and what was not, and gave you tricks. It rapidly became my 'cliff notes' for the PMBOK and was instrumental in helping me pass the exam. Bottom line it found that the book was surprisingly effective and despite its high price tag, it ended up being worth every penny. 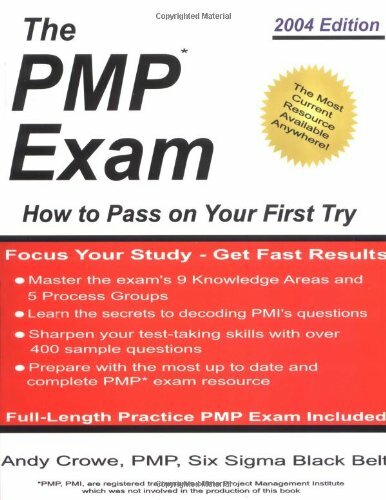 I would stronly recommend it to anyone who is preparing for the PMP exam. A good project manager will take a balanced view of IT, learn the business and gain mastery of software development disciplines. Would recommend that project managers also consider reading books on enterprise architecture. This book does present some material well. But it is more of an advertising teaser so you'll buy the whole kaboodle paying several hundred dollars. Or worse you'll be motivated to take her course paying thousands of dollars. PMP exam prep has definitely been a growing industry. The certification is by itself overly hyped up. Sometimes it all seems like a scam. One can pass PMP by just reading a bunch of prep books. Just because someone is a PMP doesn't mean a squat. I enjoy reading this book very much. I believe that this book is the best so far in the market for CISSP and as an introduction and survey to provide a solid framework for the field, and especially for those to prepare CISSP. It is very well written as a summary (better and comprehensive than "The CISSP Prep Guide" by Krutz, et al) with the orignial and critical sources. My delight and best part of this book: for each topic the author kindly provides the web sites (for further study and reading). CISSP test is very general (generic, and not for a specific product or service) and thus a frustration. But that is what CISSP is about. For professional and marketable working knowledge, use this book as a framework, along with many other good books such as (1) Incident Response (by Mandia & Prosise) and (2) Hacking Exposed (2nd ed, by Scambray, McClure, Kurtz) or (3) Maximum Security (3rd ed, Anonymous), or (4) Counter Hack by Stoudis, to supplement the reading and case study. 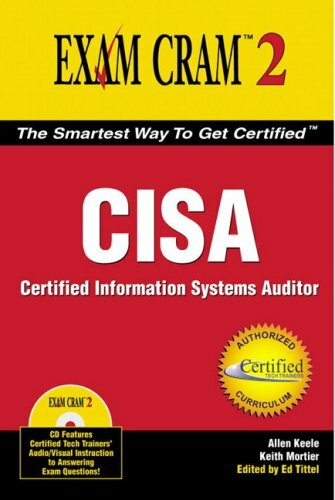 I've read most of the CISSP books out currently. The SRV books, Exam cram, prep guide, secured computing, and the first two infosecurity management handbooks. Out of all of them, this book is by far my favorite. Shon Harris presents the information in very easy to understand terms and uses vivid analogies which helped me retain more of the information. With the other books I found the reading quite dry and often caught myself losing focus. The All-In-One book was much easier to digest. Those of you who have read Bruce Schneier's Secrets and Lies should have a good idea on the writers style. Despite Amazon's information, this book comes in at 924 pages from the front to the glossary. While Chapter 12, Operations Security ends around page 840, there are almost 100 additionaly pages of interesting and relevant information. For the price I definately think this is the best buy around. 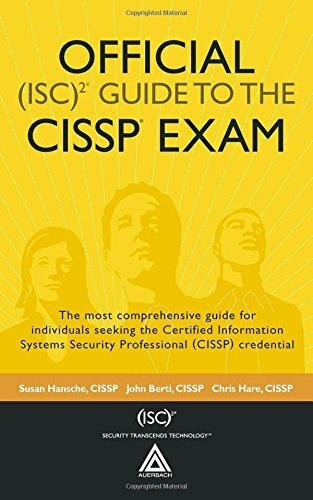 This book, along with the CISSP Exam Prep Guide by Kurtz and Vines, provided me a great deal of insight into the 10 domains of computer security and it was instrumental in assisting me to pass the CISSP exam on the first try. No book alone can inform a candidate to the level of familiarity with this topic needed to pass this very broadly scoped exam. But, this book helped me put my 20+ years of IS experience into perspective from the point of view of the ten domains of computer security. It helped provide the context and framework for organizing and thinking about the issues, helped to sort-out and standardize my terminology, informed me in some areas where I was weak and provided pointers to additional resources to supplement my understanding. This book was helpful in spite of considerable shortcomings, including errors of fact, errors in logic, and an appalling number of typographical errors that must reflect a rush to publish and a lack of interest in quality control. Errors of fact included erroneous definitions of important terms, e.g., MTTR - improperly defined as the mean time between repairs rather than the mean time to repair. Some sample questions at the chapter ends included duplicate answers, and offered wrong answers as correct ones. While this occurred infrequently, it shouldn't happen at all. Without prior knowledge, the reader wouldn't know what was true and what was in error. The book was laced with exasperatingly trite examples that distracted from the theme development in the chapters. Moreover, many of the book's sections were far too wordy and could have been distilled or provided as an appendix for those who are interested in the tutorial material, e.g., over 150 pages on the telecom and security domain alone. The sample test S/W included informative questions, but was unwieldy, error-filled and did not permit the user to suspend the exercise until later nor did it provide for printing the Q&A's in any useful way. All in all I believe the book was a considerable help to me. If you can get by the multiplicity of errors and deal with the frustrating sample test software, it could be a helpful tool in preparing for the CISSP exam. Good reference for CISSP. Easily comprehensible material. 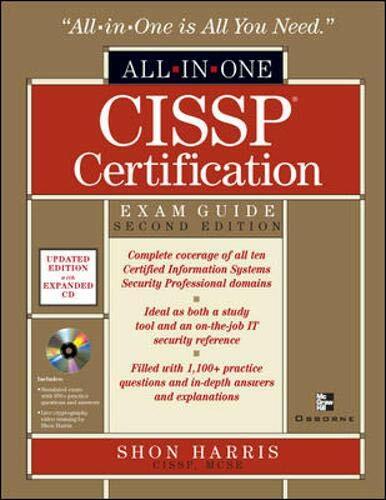 BTW, curious to know, has anybody taken CISSP exam, and not passed? This is the world's bestselling and most comprehensive reference book on telecom, data communications, networking, computing and the Internet, with over 675,000 copies sold. 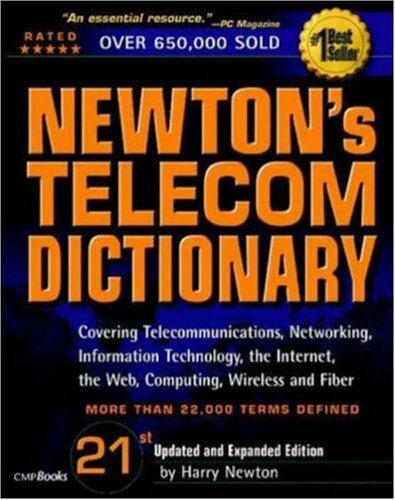 Featuring 500 new terms plus hundreds more updated and expanded entries, the 21st edition of Newton's Telecom Dictionary weighs in at over four times larger than any other telecom and IT dictionary, and includes wireless, broadband, VoIP, RFID, and fiber optics terms. Packed with over 22,400 definitions, it explains technical concepts in non-technical language that anyone can understand. It's used by more leading technology companies for training and employee orientation than any other text. Four bonus sections include: Harry Newton's favorite money-saving tips for telecom, computing, and more; what happens when telecom services are suddenly free?a vision for this business in the 21st century; how you should orient your precious telecom budget in today's tight times; disaster recovery planning to protect your computing and telecom resources. I am not going to review the content of the individual books as that is better handled in the individual book reviews. 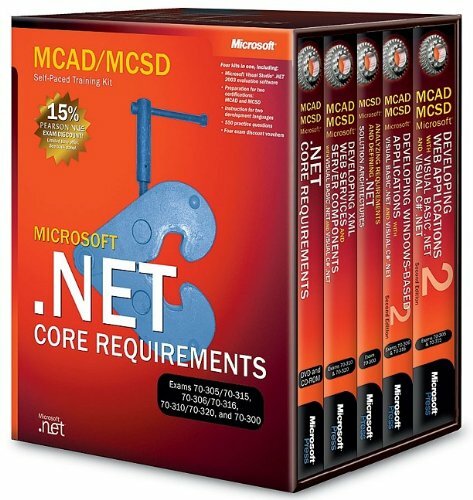 However, I think it is important to point out that Amazon is selling a "condensed" version of the .NET core requirements training kit. 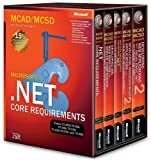 If you have seen the .NET Core Requirements set in bookstores, you remember an impressive desktop collection of hardcover books. The hardcover set takes close to a foot of real estate on your bookshelf. I was disappointed when I received this set because it is priced the same, yet is the "Paperback" version which takes about 5 inches of shelf space. How can this be if the books contents are the same? I checked the contents of "Developing Web Applications. . ." and it seemes that the contents are identical to the hardback, but I cannot vouch for the contents of the other books. Microsoft achieves this condednsed version by using the thinnest possible paper I suppose. Weigh this information with the quality of the content (from other reviews) before deciding to buy this set from Amazon. This set is a great deal when it comes with the vouchers, but still an OK deal otherwise. The books for the Windows, Web, and Web Services exams are good and they were able, with no other material, to allow me to pass those three exams. The book for the Solution Architecture exam (70-300), however, is useful only as a paperweight. That book is so poorly written, I couldn't even finish half of it! Fortunately, Exam Cram 2 has an excellent book for that exam. Not only is this set cheaper than buying the three good books separately, but the paperback editions in the set are lighter and smaller as well. This kit is a great way to reinforce what you THINK you know and to learn new things. I'm not concerned like some of the other reviewers that the materials are not great for test cramming--these books helped give me confidence to pass the tests because I know the stuff cold! And I've passed the two Core C# tests, each the first time! Thanks Microsoft Press! 1) each book is light enough for me to carry in my backpack everyday. 2) Content may not be in-depth but is decent enough. 3) Exam questions are much better than QUE books. This is arguable However I just passed 70-315 and I can tell you that many of the questions were awefully familar thanks to the practice questions that came with the set. No discount code in my set but I bought the voucher from online companies that offers 10+ % discount. 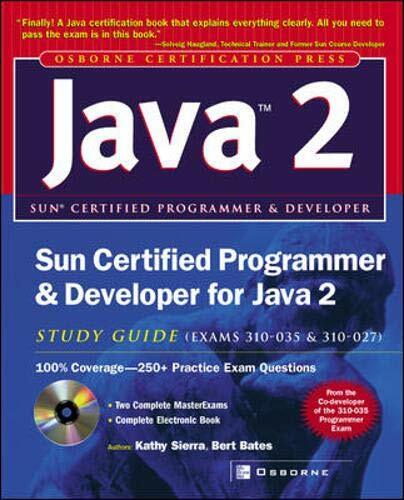 Revised and updated by one of the co-developers of the (310-035) Programmer exam, this edition offers complete coverage of the Sun Certified Programmer for Java 2 exam objectives and newly added, complete coverage of both portions of the Sun Certified Java 2 Developer's exam. More than 250 challenging practice questions have been completely revised to closely model the format, tone, topics, and difficulty of the real exam. An integrated study system based on proven pedagogy, exam coverage includes step-by-step exercises, special Exam Watch notes, On-the-Job elements, and Self Tests with in-depth answer explanations to help reinforce and teach practical skills. 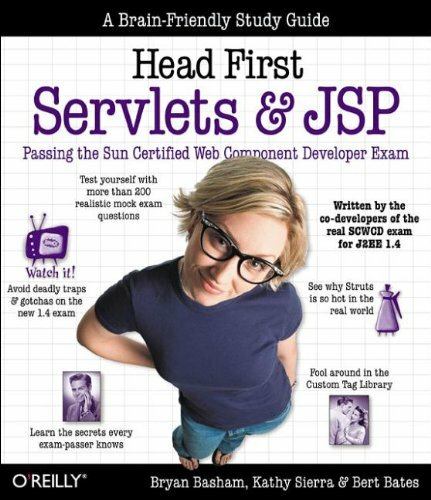 "Who better to write a Java study guide than Kathy Sierra, the reigning queen of Java instruction? Kathy Sierra has done it again—here is a study guide that almost guarantees you a certification!" "The thing I appreciate most about Kathy is her quest to make us all remember that we are teaching people and not just lecturing about Java.Her passion and desire for the highest quality education that meets the needs of the individual student is positively unparalleled at SunEd.Undoubtedly there are hundreds of students who have benefited from taking Kathy's classes." "The Sun Certification exam was certainly no walk in the park but Kathy's material allowed me to not only pass the exam, but Ace it!" I just started programming 8 months ago, I found that Java is the best language that I can study, and I found that the fastest way to learn is to get certified from the source, they know what you need, I bought that book and started studying. Because I'm new to programming, it took me 6 months to prepare for the test, I took the test and got 88%. By the way I made the localization for a huge militarian project and I made it neat, great thanks for the book authers. Imagine this: you're in college, studying for the final exam -- and the teacher gives you all of her notes that spell out EXACTLY what you need to know, what you DON'T need to worry about, and even points out all the little traps she'll try to catch you in when you take the exam. Kathy Sierra, the co-developer of the 310-035 Programmer's exam, with the help of Bert Bates has done just that. The 3rd edition of Osborne's Sun Certified Programmer and Developer for Java 2 is an awesome book. Get this -- it's actually entertaining to read, very easy to understand, and the mock exams more closely resemble the real thing than any other mock out there. The "Two-minute Drills" are an excellent resource to help you review before you take the exam. The Exam Watches interspersed throughout the chapter point out all the traps you might fall in during the exam, and the On The Job blurbs give you a practical application for the knowledge you just learned. The end chunk of the book discusses what you need to know to pass the Developer s exam. It won't teach you Swing or Threads - but what the exam assessor's are looking for - the things you need to pay attention to in order to pass that exam. I fully recommend this book. Make sure you check the author's website for the errata -- the first printing was a bit buggy, many errors have been fixed in the 2nd printing. I gave SCJP1.4 in July 2004 & scored 95% (58/61). I would like to share my success story to all fellow aspirants who wanna clear SCJP1.4 with top score. Kathy's book is must. Kathy & Bert have an awesome writing style & they literally burnt the core concepts into my head. 1) I read Java 2 Programmer by Exam Cram first. This gave me good kick start. 2) Then I read chapters which I was weak on from different books. b) Threads - From Simon Robert's certification book. c) Inner Class - From Simon Robert's certification book. 2) This book (by Kathy Sierra, Bert Bates). You can skip first few chapters but solve all their review questions. Read method overloading, exceptions, inner class, Threads, Collections, java.lang, hashcode & Garbage Collection completely. 3) Gave all related topic tests from www.javaprepare.com, Dan Chisholm's single topic exams. 5) Gave Marcus Green mock test. 6) Kathy's book simulator exam. 8) Do review questions from Khalid Mughal's book on method overloading, Threads, Garbage Collection & collections topic. 9) Please read each line of code, each question sentence to avoid careless mistake. 2 weeks of real study should take you to achieve real good score. Once again, SCJP1.4 is not simple as such. Its tricky. Questions on threads, method overloading, OOPs, Garbage Collection were on same toughness with Whizlab tests. I credit my success to Kathy Sierra & Bert Bates. I had fun studying for SCJP1.4. Passing is easy but scoring is tough!! I'm an experienced Java programmer. I passed the SCJP(310-035) with 98% (answered 60/61) recently. This is *THE* book. Everything is very well explained, gets you hooked on like a novel. The mock exams were very similar to the real one I faced. I recommend this book to any experienced Java programmer planning to take up the exam. I passed the SCJP with 93%. This book was my primary reference while preparing. It covered the topics well, and more importantly, introduced me to the various (and indirect) ways those topics would be tested on the exam. I found it useful to compile and run some of the code (don't use an IDE). The practice exams identified some areas I was weaker in, and I made sure to write some test code that would make me more familiar with those areas. It helped me get comfortable with garbage collection, bitwise operators, threads and inner classes. I was familiar with those topics before, but rarely had to implement them in code. Integrating the code snippets into code took very little time, and helped me understand those topics better. I also chose to not use an IDE so that when I made a mistake, I had to go and figure it out myself rather than have the IDE catch it up front. Of course, the mock exam links on www.javaranch.com are very useful. I took as many tests as I could, even ones that were clearly created for previous versions of the exam. As a future CISSP, I found this book very incomplete and difficult to read. I was given this book in a course, however I would not buy it. I expect a 2nd edition to come out next year. The authors made many efforts to assure that there were not errors in the "The Official (ISC)2 Guide to the CISSP Exam," most notably having every chapter reviewed by subject matter experts in the field. It was our goal to provide a comprehensive study guide and reference tool for the CISSP Common Body of Knowledge. If there are errors, we want to know about them and make corrections. In order for us to ensure that the book is responsive to the information system security community, we would like to hear your specific comments - both positive and constructive criticism. If you would like to send comments to us, especially an error that you find in the material, please send an email to cisspbook@cox.net. Please include the location in the book (i.e., page number and paragraph/line number) with your comment. If you are reporting an error, please indicate how you think it should be corrected and any appropriate reference material that verifies the correction. P.S. For those wondering why I rated my own book, this system will not be let me leave the star rating as blank. I was so excited to review this book and am so unbelievably disgusted and saddened. It has so many errors, I am not sure how 3 authors could not have caught them. I pray that the actually CISSP exam does not have so many errors embedded into it if this is the official study guide. I am afraid that people who are not security professionals will learn the wrong information if they study this book. After months of wait, finally book is in the market. I was expecting better presentation and ultimate reference from ISC2. I was really disappointed. Even than it is a must have book because it "Official" guide. However, don't just focus on this one, it is too verbose but still as its is "official" you have to read it. Look for other resources like "CISSP Study Guide in SimpleFAQs" by PacificIS, " CISSP All-in-One Exam Guide" by Shon Harris and cccure. Ace your preparation for Exam 70-270and expand your knowledge of Windows XP Professionalwith this popular training kit, now fully updated for Windows XP Service Pack 2 and other key topics. 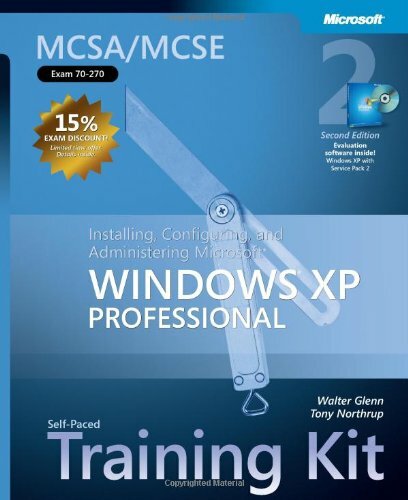 Designed to help maximize your performance on the Windows XP exam, a core requirement for MCSA or MCSE certification, this kit packs the resources that exam candidates want mostincluding in-depth, self-paced training; rigorous, objective-by-objective review; exam tips from expert, exam-certified authors; and a robust testing suite. It also provides real-world scenarios, case study examples, and troubleshooting labs for the skills and expertise you can apply to the job. Topics include installing or upgrading to Windows XP Professional, including automated installations; configuring and managing hardware, disks, and file systems; configuring and customizing the desktop environment; administering security features, including the advanced security technologies in Windows XP Service Pack 2; managing TCP/IP networking; troubleshooting the boot process and other system issues; supporting remote and mobile users; and monitoring resources and performance. Work at your own pace through the lessons, exercises, labs, and review, then use the Readiness Review Suite on CD for in-depth self-assessment and practice. Featuring advanced technology from MeasureUp, Readiness Review delivers 425 challenging practice questions with your choice of timed or untimed testing mode. You can generate random tests or focus on discrete objectives or chapters. And you get detailed explanations for right and wrong answersincluding pointers to other sources for additional study. This book covers the topics examined by the 70-299 test with enough detail that if you have a moderate amount of experience with Windows Server 2003 you will pass the exam. I would recommend that you use VirtualPC to simulate this stuff in your own lab if it isn't feasible to do so on your production network (setting the company DC to Secure Server Only IPSec can be a bad idea without having workstations properly configured). The practice questions, both in the book and on the accompanying CD-ROM are good preparation. Coming into this exam I already had passed the Windows 2000 version. I recommend that you buy the book and do the exercises. Also, get your core exams out of the way (networking, AD, Server) as you'll need some of this knowledge as well. 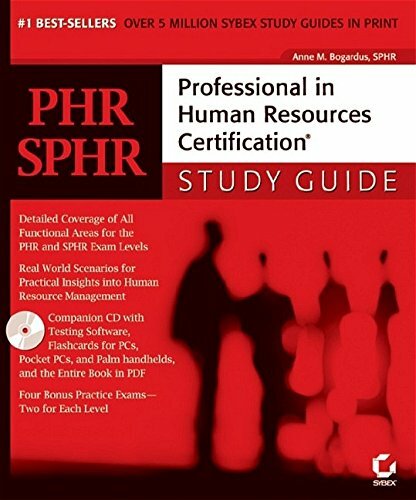 I passed the SPHR examination in June 2004, after only a month and a half of preparation (besides years and years of experience) and credit the study guide with making it possible for me to acheive that result. Anne Bogardus' book is not intended to be nor does it pretend to be a complete reference book for the entire body of HR knowledge. It is an excellent study guide and it provides references for the student to use for additional study in each of the six functional areas, should the results of the study guide's exams (three overall assessments plus one exam for each functional area) indicate that more work is needed before taking the certification exam. I took the SPHR exam in June 2004 and passed, with the help of this book most definitely. In order to pass the exam, I highly recommend using numerous resources, because HRCI uses different terms that may not be found in any one book/resource. I used this book as a primer, and also used the SHRM Learning System, along with HR Management by Mathis, and began studying 6 months prior to the test date. This is a valuable book, and the test questions were helpful, but don't think that this book is the one and only resource that will help you pass the exam, because it won't suffice on its own. Another helpful hint: the practice questions in this book (and the practice questions in the SHRM Learning System) are MUCH easier than most of the questions on the exam, so be prepared! 5 Stars because I can select 10!! I am currently teaching the A+ course and this mean coverage of the newest CompTIA exams, the 220-231 and 220-232. The material in these updated exam requires the best possible training guide and once again Mike Meyers is leading the pack. Making sure that the material is the most up to date this release is not the first on the market but it one of the best on the market. I had the opportunity to help create practice questions for this book so I can say the material is first rate. Meyer's once again leaves no stone unturned as he covers far more than the exam calls for. His ability to blend humor with knowledge is what makes this book so successful. Meyers take apart every objective and breaks it down into comprehendible and manageable information; all you have to do is pass the exams. In the over 1100 pages there is the complete exams right before you. This book is one of the first I have seen to cover all the Operating Systems including Windows Me and NT, again Meyers take you beyond the standard cut off point. Meyers has set the bar that all others will have to exceed and judging form the amount of information this is going to be very difficult. One of the things that always impress me is that Meyers gives you the history, this allows you see where things began and how we got where we are today. The cd includes hundred's of practice questions, practice exams and videos to help you study and pass the exam first time. Overall about the only to add is a virtual lab included, however with all that is included this is a very complete package. The fifth edition leaves you drowning for information. I used the fourth edition to pass the A+ Core exam with flying colors. The fifth edition was used to study for the A+ OS exam, 2003 guidelines. After taking the exam, this book provided at best 25% of the material covered on the exam. While no book should teach to a test, a book dedicated to an exam should teach the material that will be tested. The A+ premium practice exams were purchased from totalsem.com, they too fell well short of preparing an individual to take A+ OS exam. DISCLAIMER: I haven't read the entire book, but rather made a thorough skim, and have no intention of taking the 2003 exams, any time soon. Having said that, here's my opinion. 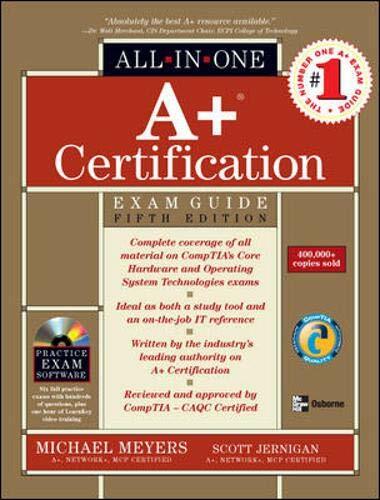 I used the 4th edition of A+ All-In-One to pass both Core hardware & OS under the 2001 objectives. That book was about as close as you could get to being a perfect primer for those exams, AND was indispensable (at least for me) introduction to how computers work. It was a perfect balance between accademic and hands-on concepts. It was so good, in fact, that I was inspired to buy the 5th edition. I'm sure glad I got it used because it just doesn't measure up to its predecessor. First of all, there are quite a few words & abbreviations that are casually refered to with no explanation. Theses terms were well explained in the 4th edition, but not anymore. This, to me, appears to be some pretty sloppy editing, as updated information has not been properly coordinated with previous edition. Anyway, I think I've made it clear. If you really want a clear understanding of the PC and how it works, get the 4th edition of A+ All-in-one. It will be well worth your time if you are new to computers, and you can now get it used for less than half of the 5th edition. THEN study for the A+ 2003 objectives. But definately research other material. The 5th edition just won't cut it. Good luck!!! I'm a software trainer who wants to become certified as a PC technician. The author claims that this book will be able to teach the novice (non-PC technician) everything he/she needs to know to pass the A+ certification exams. That's a joke. The first few chapters start out fine, and seem to provide explanations that are thorough and clear enough for the novice. But then at some point (right around chapter 6), the author forgets who his audience is and seems to assume we're all working as PC technicians already. His explanations start to get more more vague, and he uses more and more tech jargon and inside jokes that only a tech would get. It's obvious who he's really writing for. 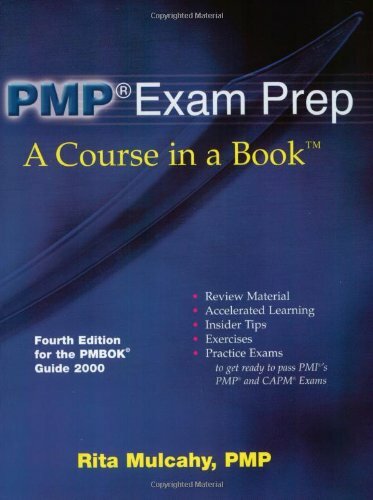 This was the first book that I used to begin studying for the PMP Exam with. (I passed Dec.1st/03) It is simple and easy to understand. However, the questions are much easier than the actual PMP Exam. There is alot of information missing from this book that is critical for the PMP Exam (other Earned value calculations, definitions etc.) Use this to introduce yourself to the concepts, but do not use it as your only study material. I supplemented this with Kim Heldman's book which filled in some of the gaps. I then took Rita Muchaly's PMP Exam Prep course. This was invaluable. Although I already knew 90% of the material, the course taught me how to interpret and read the questions and pick the "betterer" answer. Plus, the order of planning processes which Andy Crowe presented in his book was different than the order of activites in Rita's course. I took Rita's sequence to be true, as she was previously on the committee who created the actual PMP Exam questions, so she would know the right sequence. Rita's PMP Exam prep questions provided in her study kit were very similar in difficulty and structure as those on the PMP Exam. If you only have so much money, take Rita's course and/or buy her Exam Prep System which includes flash cards, a CD of 1300 exam questions and her book. The book is over-priced, as it does not include a CD with questions on it. PASS. First time out. Any questions? Seriously, I read the PMBOK cover to cover. DENSE. All the information is there, but it lacks several things that are crucial to a successful PMP exam preparation: intuitive organization, practice questions, and real-world applications. Andy Crowe's book fills the gap. It presents the information in a structured, easy-to-understand format that guides you through the 39 discrete processes, their interaction, and most importantly, what you need to know about each one to pass the exam. The final exam takes the concepts presented in the book and makes you think about them from yet another angle, and the fact that all the answers are there provides the last step in cementing the information in your head. My score on Andy's final and my score on the PMP exam were within 5 points of each other, so he obviously got it right. The PMP exam is extremely situational. Some questions have four correct answers! What they want from you is the BEST answer. Many others focus on order of operations and ask what you, as the project manager, should do FIRST. These real-world situations are covered clinically in the PMBOK, but stressed in detail in this book. Buy it. Read it. And Pass the PMP. I did. I've been a Project Manager for many years now, have always been interested in obtaining a PMP but never found the time or the right resources. This book is a perfect combination of both. It is easy reading and easy to understand. If you are disciplined enough to read the book, take good notes, take and review the practice exams you can also be a PMP very soon. I waited too long to accomplish this goal because I didn't know what tools to use. If you've found this page, you've found the right prep book to get the job done for you. I performed a quite extensive searching on the bibliography focused on preparing candidates for PMP certification. My requirements were clear: "I do not want to read again a huge sort of books to learn how to manage a project. I need a book that teach me in a direct way how to approach the PMI exam to be able to pass the exam". Guys: This is the book. I selected the Andy Crowe's one and after passing the PMP exam, in my first try, I am convinced I made a good choice. The whole book is remarkably well written, direct, clear and smart. It includes the nine Knowledge Areas of PMI's PMBOK plus the Professional Responsibility chapter. There are an exam for every chapter and a Final Exam with 200 questions. The answer of each exam includes a splendid explanation of why the answers are right or not! Every chapter has a books reference named "Going deeper" which is a real gem for identifying more source for additional learning, even after passing the exam. I have only two complaints: a)the bookbinding is some weak. b)Standard deviation formula included in the book is not the traditional one, so review your statistical sources. The book is some expensive, but if you pass the exam, it worth the investment, don't you think that?. Read PMBOK a couple of times, this book and you are ready to attempt the exam. I passed PMP using this book! Overall a very good book in the context of Fundamentals and objectives of the exam SCBCD. I am giving it 4 stars because I felt that an "Exam Quick Prep" at the end would have helped in the last minute studying for the exam. I also think that giving a flavour of design patterns would have been beneficial..
Having said that, for the advanced readers in my opinion Richard's "Enterprise Java Beans" is more applicable and interesting. 1. )Kathy's Book "Head First EJB"
This is a very excellent book for SCBCD. Anyone interested to pass the exam should not miss this book. This book is very clear and makes learning EJB very easy. This book is very outstanding and I wish the authors write more books so that we can enjoy them. I passed the SCBCD with a score of 92% and I am very thankful to the authors. I cannot imagine how difficult it would have been to learn EJB without this book. My review probably stands out like a sore thumb from all the others raving about this book. I was disappointed from the moment I opened this book. Remember: if you LIKE cartoons and lots of funny diagrams, cute (read 'annoying') scribbled notes littered around paragraphs, a ton of smiley faces, farm animals leaping pages, etc etc then this book is for you. I found the drawings cheesy and distracting. The hundreds of 'special' scribbles and bold and shaded paragraphs only took away from the value of the subject matter. The book is designed to grip and retain the interest of the young audience and maybe for people who have attention deficit disorder. If you are a normal guy like me, who is committed to reading the book then you can pick up and run with any of the other splendid and meticulous books written on EJBs. I would highly recommend Enterprise JavaBeans from O'Reilly. Aside from that, the subject matter in this head first book seemed to be well covered and in appropriate detail. I just passed the exam using only this book and my own EJB experience. This book provides a thorough review of everything needed on the exam. For all you "just the facts ma'am" types, I'd like to say that I'm one too, but if you relax and enjoy the humor in this book, it actually does make it an easier read. The conversational style also helps in comprehension and retention. The only downside is that occasionally the humor contains what I would consider to be inappropriate language. Overall however, I highly recommend this book. Great study guide for SCBCD ! 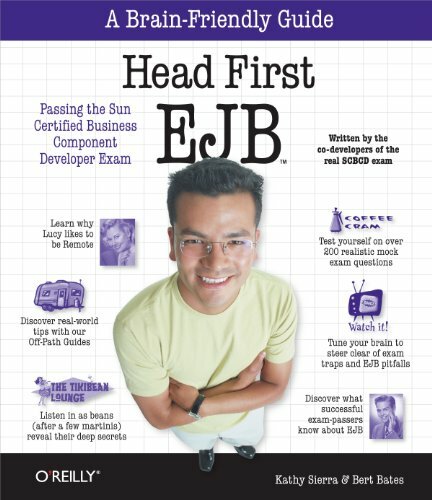 In my opinion Head First EJB is a great study guide for the Sun Certified Business Component Developer exam. It's format is designed to make you understand and remember things in an easy and fun way and it definately worked for me! I studied for the exam mainly using this book, and passed with a score of 97%. The book explains all aspects you need to know clearly and contains many useful excercises and mock tests. Altough it covers not every tiny detail of the specs and the exam, I'm sure you will pass the exam if you know this book in and out. I already had some experience wit EJB and the book made me understand a lot of what's going on behind the scene! So i'ts not only a good book for SCBCD, but also a very good and thorough introduction/course to the EJB-theory ! Announcing an all-new MCSA/MCSE Training Kit designed to help maximize your performance on Exam 70-290, a core exam for the new Windows Server 2003 certification. This kit packs the tools and features exam candidates want mostincluding in-depth, self-paced training; rigorous, objective-by-objective review; exam tips from expert, exam-certified authors; and a robust testing suite. It also provides real-world scenarios, case studies, and troubleshooting labs for the skills and expertise you can apply to the job. If you don't know the product, you will not pass. This book will help you pass. If your only experience with Windows Server 2003 is installing it twice and running a few applications then you WILL fail the 70-290 exam no matter what book you buy! The MCSE is not like it was back in the NT4 days when you could train your parrot to pass the exams. You need to know what you are doing. This book is reasonably good at building on the exam objectives, but in some cases you will need to look at Technet. 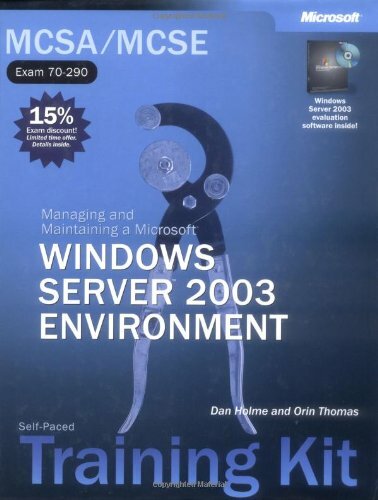 If you buy this book and fail the exam, don't blame the book - have a good look at the amount of experience you had going into the exam with Windows Server 2003. I passed this exam and this book helped (though my experience with the product, and prior Microsoft server operating systems did as well). Use another book as well as this one. This is probably the tenth Microsoft Press book I've purchased, and it is no different than the rest of them. While the technical aspects of the material seem adequate, I think there needs to be more detail. The exams always seem to contain a few questions that only Technet can help you answer. An exeption to this was the Microsoft Press MCSE study guide for 70-216, which was very detailed. Another bad thing about this publication (70-290) is the CD, which contains a few typographical errors and what I believe to be wrong answers on a few of the Readiness Review questions; namely a claim that a RAID-5 array isn't fault tolerant, which it clearly is. If you are considering purchasing this book, please do yourself a favor and check it out first. Read through some of it, and verify its accuracy with other publications or online material. The 2003 Server Administrators Guide is much better written and contains more real world scenarios than this book. Use it as a backup. Hope this review helps, and good luck on the exam. I've just finished reading this book, it contained almost everything I needed to know for the exam. It was written in easy to understand language and coupled with the recommended experience in the server field should be a breeze for others to comprehend. Great to see an Australian writing such an important MSPress book too! I did the exam 2 weeks ago (passed) after using this book along with Trancenders but struggled in the exam. You would need to have a second book to give you a rounded view of the subject areas. Also the exam is based on a lot of real world examples not covered in the text (a lot of stuff on backing-up) also a lot of areas in the book were not in the exam. If you are new to 2003 spend some time working with the material before tackling the exam. Poorly written and way out of context. My advice to anyone wishing to learn the real ins and outs of 2003 server would be to buy Mark Minasi's book - he offers much better advice geared towards the real world and his chapter on DNS is far superior to the drivel written in this publication. I particuarly dislike the monotonous tone that so often is the down fall of Microsoft publications. On the upside - this book is given it's blessing by *Microsoft* - so it must have something going for it. The section on Group Policy is not bad. As a Cisco Academy student I bought this with the intent to supplement the lab activities and to do labs when lab time was not available. As another reviewer noted, the first thing it asks is if you want to upgrade. 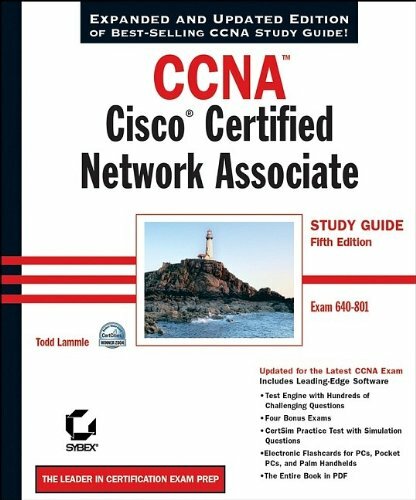 I am finishing the second half of the CCNA 1&2 book and this was a help with some of the early labs. As we got further I noted commands missing and not enough hardware can be set up to do the labs. I found the access-list command not working which blew away any ACL labs and practice. It just isn't worth the money for a serious student. I am upgraging to Router Sims NetVis 4.0 (actually the same engine this one uses, this is a scaled down version that Sybex resells). It has all the Cisco Academy semester 2 labs and looks like it covers all the commands. Appears to be a much more comprehensive simulator for about 80 bucks more. See the comparison at their web page. This will give you a feel for router configs, but has too many limitations to be more than just a toy. 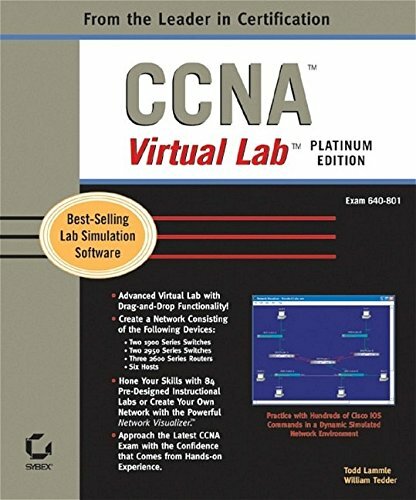 If you are serious about CCNA lab and practice, you will find this lacking very quickly. Virtual Lab is far better than any other simulation available in the market. Esp for those who do not have regular access to switches and routers or networks. Todd Lamllhe's book and Virtual Lab make a wonderful combination. hope this review helps . Buy the CCNA Gold Edition Used. This product offers nothing of value over the Gold edition except for drag and drop. Creating my first network, I was shocked that I was limited in adding only two switches and three routers. Not much playing around or building with that limitation! Todd Lammle, the Gene Simmons of Cisco training material, forces you to upgrade for any additional functionality on this already extremily over priced, very basic program. Do yourself a favor and save your money and buy the used Gold version. This brand-new edition of the best-selling security book covers all the latest hacks and countermeasures and includes a bonus DVD with the authors’ famous “Hacking Exposed Live” presentation! Time to reposition the "Hacking Exposed" series? I am a senior engineer for network security operations. I've read and reviewed every edition of the "Hacking Exposed" series since the 1999 original. "Hacking Exposed" is a winner; the authors' powerful example-driven style teaches the tools and tactics of vulnerability assessment and penetration testing. Nevertheless, I've compared this third edition to its "Hacking Linux" and "Hacking Windows 2000" cousins, and I believe the authors should rethink their goals for the "Hacking Exposed" series. "Hacking Exposed, Third Edition" (HE:3E) describes techniques to attack and defend a wide variety of network assets: Microsoft products (9x, ME, NT, 2000, XP), UNIX variants, Novell's NOS, routers, PBXs, firewalls, and so on. Weaknesses in individual applications are explained, with attention given to remote control tools (VNC, Windows Terminal Server, PCAnywhere), Web technologies (IIS, ColdFusion, ActiveX, Java), and file sharing/chat systems (Napster, IRC). Readers are unlikely to find so many topics given fairly thorough coverage in a single volume. Unfortunately, at 727 pages, HE:3E has gained too much weight. The 1999 first edition offered 484 pages, and the 2001 (yes, 2001) second edition gave 703 pages. While the authors should be credited for not simply copying and pasting material from their 2001 edition of "Hacking Exposed: Windows 2000," many of the same topics appear in both books. Furthermore, some subjects are redundantly described within HE:3E. For example, why rehash port redirection and rootkits in chapter 14 when they were adequately covered in earlier sections? I strongly recommend the authors remove the UNIX- and Windows-specific material from a future fourth edition of "Hacking Exposed," directing readers to "Hacking Linux" and "Hacking Windows" when necessary. The authors should briefly describe general UNIX and Windows vulnerabilities in "HE:4E," and devote most of the book to their methodology and systems not covered in other books. This overhaul will give the authors a chance to remove some dated material from "Hacking Exposed," like a reference to ISS RealSecure v3.0 (6.0 is now in use). I recommend readers who have not read previous "Hacking Exposed" titles buy this book. Despite my concerns, I still learned something new (wireless issues, format string vulnerabilities) and re-acquainted myself with material mentioned in earlier editions (RIP spoofing, enumeration techniques). If you've read "Hacking Exposed, Second Edition," wait for a revamped fourth edition. "Hacking Exposed" series grew from a relative unknown to one of the most famous information security books of all times. The interesting part about it is that its reputation is largely deserved. The fourth edition presents an incremental improvement over the previous ones. Considering that the previous books were great, it is no mean feat! Its is a pity that the book lacks "What's New" section, which would be useful for those familiar with the series. As usual, the book offers balanced platform coverage (UNIX, Windows, Novell) and follows the same winning paradigm (from scanning to owning the system). The above is obvious since the same author crew from Foundstone is behind the book. The book is somewhat biased towards the attacker side, just as the title promises. Among new sections are wireless security, web hacking and attacking clients (such as web browsers) by malicious servers. The latter section presents some interesting tips on attacking over email, web browser (via ActiveX and other malicious technologies), IRC, etc. Overall, if you own the 3rd edition, there is some motivation to go grab this one. However, if you haven't read "Hacking Exposed" yet, run to the store to get your copy if you are involved with network or system security in any role. For novices the book will server as a useful introduction to security and hacking, for intermediate readers the book will bring new tools and techniques and will serve as a useful refresher for experts. Companion website hackingexposed.com has the books' table of contents and some other material. I have plenty of experience with computers and have been hacking since the term Hacker wasn't a dirty word. Anyway, a friend of mine that is very interested in Hacking purchased this book and a few other titles from these authors. He showed me the books and asked me to give him my opinion of them. As I was looking thru these books I started to laugh and told my friend to get his money back. I was shocked to see that all the info in these books can be obtained just by doing a search on SecurityFocus and Google and most of the info in this and the other books where outdated exploits that have been patched already. The IT industry moves at the speed of light and the most important aspect when it comes to securing your networks is having the newest attack and exploit information, which no book can ever provide... including this lousy book that is nothing but a compilation of what can be found for free online. Don't waste your money! I wish I could give this book zero stars. This is the first book that I have encountered that discusses how to set up larger networks - perils and pitfalls. It tells you what to look out for, various inteference, overlapping channels, site surveying, wireless security, transmission power, FCC regulations, etc. This is an essential guide that should be part of a library (even if the library contains only one book). It is on par in the same light as how the Kernighan & Ritchie bible is for C programming. Another book I recently received which seem to pair very well is "Deploying License-Free Wireless Wide-Area Networks". The key word here is "Wide-Area" so this is more for geared towards setting up a LAN for perhaps a condo/cumminty development and larger, not SOHO or home network. Well....were do I start. I took this exam twice before passing it. I think the problem was that I really didn't read the book from cover-to-cover. So on the third try I read this book 6 times. In short READ this book from cover to cover. A hint: foucs alot on chapter 11 because it hits about 30 percent of the objectives and you cannot check your answers after you move on to the next question. Now thier are some questions that are not in the book like 802.3af standard(s), so read some white papers. This exam is very hard. The question all seem to be right so you MUST know the aswner like you have worked in the field and that is why this certification is a good one to get. Well....good luck in your testing and take your time. This is probably the most comprehensive and detailed book about wireless technology that has been written.Everything is from FCC rules to RF site surveys are covered in this one book.I passed the CWNA exam on my first try.Everything you need is covered in this book.Well written. I can't state it more directly: this text covers exactly you will see on the test. This was my one and only study source, and I got ~90% on the test. Nuf said on that. 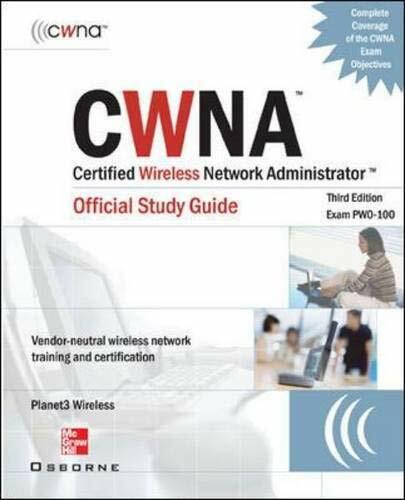 Even if you're not interested in the CWNA certification, this text is quite adequate in serving as a reference for wireless technologies. Even my grand mother from the remote bush of Africa could have read this book and pass her ccna exams. Only if she had had the chance to grab hold of this book before she passed on. Jesus!! I never new IP subnetting was that easy. Oh!! the CLI(command line interface) did i say command or cash line interface? Well I now know it. In fact as a newbies all the way from the Jungle with no IT background. This book was just too good for me, all the others almost scared me of from CCNA. This book reads easy, explained clearly what u needs to no, concepts are well detailed out in an understandable manner. 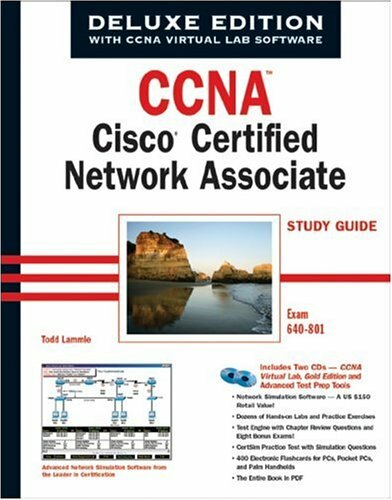 In fact this book for me is a six stars not only for preparing for the CCNA Exams but also for just given people like us who knows nothing about the theory and concept of networking the opportunity to read and understand what it is all about. How it works, and how to use and apply it in pratical situation.